In April 2018, investigators in the U.S., U.K. and the Netherlands took down attack-for-hire service WebStresser[. ]org and arrested its alleged administrators. Prior to the takedown, the service had more than 151,000 registered users and was responsible for launching some four million attacks over three years. Now, those same authorities are targeting people who paid the service to conduct attacks. In the United Kingdom, police have seized more than 60 personal electronic devices from a number of Webstresser users, and some 250 customers of the service will soon face legal action, Europol said in a statement released this week. “Size does not matter – all levels of users are under the radar of law enforcement, be it a gamer booting out the competition out of a game, or a high-level hacker carrying out DDoS attacks against commercial targets for financial gain,” Europol officials warned. The focus on Webstresser’s customers is the latest phase of “Operation Power Off,” which targeted one of the most active services for launching point-and-click distributed denial-of-service (DDoS) attacks. WebStresser was one of many so-called “booter” or “stresser” services — virtual hired muscle that even completely unskilled users can rent to knock nearly any website or Internet user offline. Operation Power Off is part of a broader law enforcement effort to disrupt the burgeoning booter service industry and to weaken demand for such services. 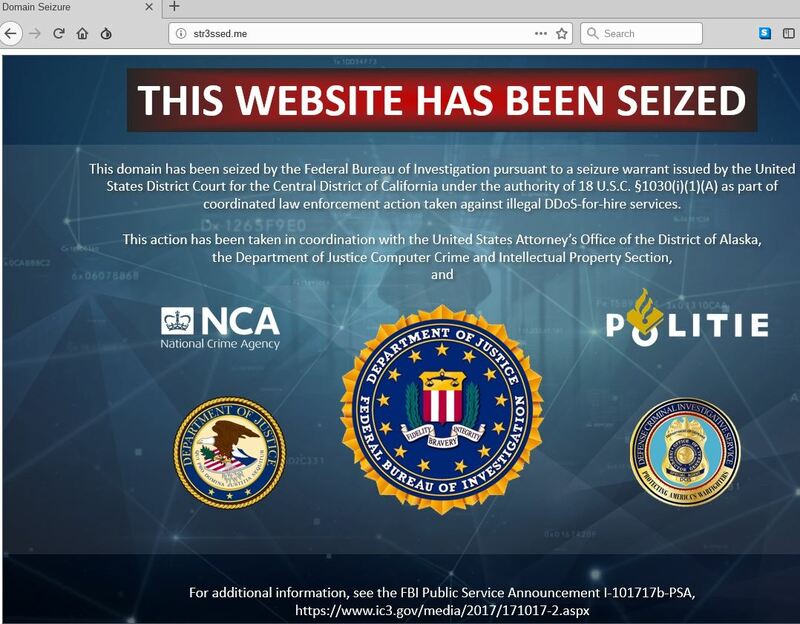 In December, authorities in the United States filed criminal charges against three men accused of running booter services, and orchestrated a coordinated takedown of 15 different booter sites. The takedowns come as courts in the United States and Europe are beginning to hand down serious punishment for booter service operators, their customers, and for those convicted of launching large-scale DDoS attacks. Last month, a 34-year-old Connecticut man received a 10-year prison sentence for carrying out DDoS attacks a number of hospitals in 2014. Also last month, a 30-year-old in the United Kingdom was sentenced to 32 months in jail for using an army of hacked devices to crash large portions of Liberia’s Internet access in 2016. In December 2018, the ringleader of an online crime group that launched DDoS attacks against Web sites — including several against KrebsOnSecurity — was sentenced to three years in a U.K. prison. And in 2017, a 20-year-old from Britain was sentenced to two years in jail for renting out Titanium Stresser, a booter service that earned him $300,000 over several years it was in operation. Many in the hacker community have criticized authorities for targeting booter service administrators and users and for not pursuing what they perceive as more serious cybercriminals, noting that the vast majority of both groups are young men under the age of 21 and are using booter services to settle petty disputes over online games. But not all countries involved in Operation Power Off are taking such a punitive approach. In the Netherlands, the police and the prosecutor’s office have deployed new legal intervention called “Hack_Right,” a diversion program intended for first-time cyber offenders. Europol says at least one user of Webstresser has already received this alternative sanction. “Skills in coding, gaming, computer programming, cyber security or anything IT-related are in high demand and there are many careers and opportunities available to use these wisely,” Europol said. According to U.S. federal prosecutors, the use of booter and stresser services to conduct attacks is punishable under both wire fraud laws and the Computer Fraud and Abuse Act (18 U.S.C. § 1030), and may result in arrest and prosecution, the seizure of computers or other electronics, as well as prison sentences and a penalty or fine.